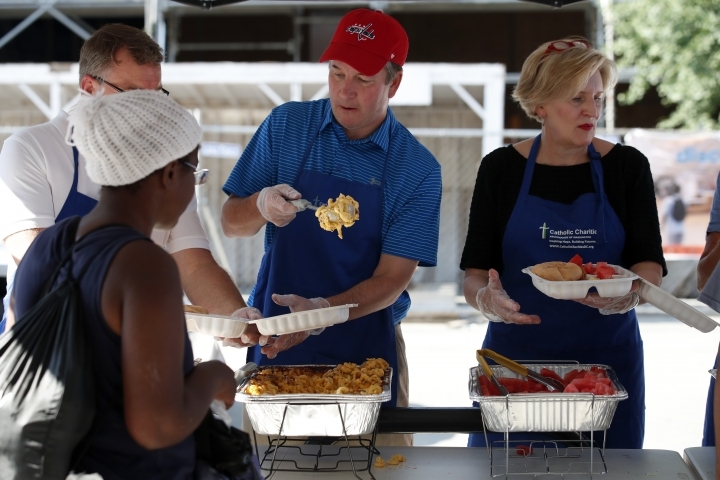 WASHINGTON — Pausing in his pursuit of Supreme Court robes, nominee Brett Kavanaugh donned a blue apron Wednesday afternoon to help serve meals to the homeless. "Want some mac?" Kavanaugh asked, as he scooped it into paper to-go boxes to accompany barbecue sandwiches, watermelon and chips. Kavanaugh was greeted by Monsignor John Enzler, the president and CEO of Catholic Charities in Washington who has known the judge from the time he was an altar boy. Enzler, who attended the White House announcement Monday, said Kavanaugh is part of a Roman Catholic society that volunteers to serve meals a number of times a year. "He's a man for others," Enzler said. "It's all about service." A graduate of a Jesuit high school and an active member of a local Catholic church, Kavanaugh stressed his faith in his remarks at the White House on Monday and acknowledged Enzler and Catholic Charities. "I am part of the vibrant Catholic community in the D.C. area," he said. "The members of that community disagree about many things, but we are united by a commitment to serve." Earlier in the day, Kavanaugh returned to Capitol Hill to meet with key Republican senators as Democrats escalated efforts to block his confirmation. Republicans hope to have Kavanaugh confirmed by the start of the court's session in October. Democrats, who are in the minority, may not be able to block him, but they argue that Kavanaugh would shift the court further to the right, potentially threatening access to abortion and undermining the Affordable Care Act.